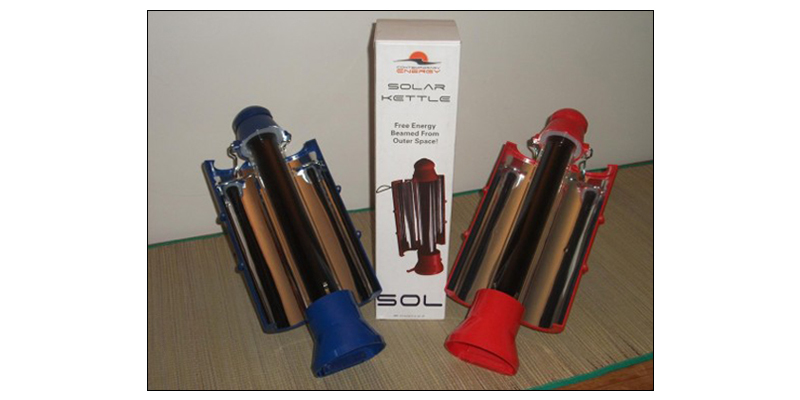 This solar kettle is now in production after many years in development. It is extremely portable and stylish too, the reflectors fold out when in use to gather three times more energy than with just a plain solar tube, but during transit the reflectors are folded in to protect the tube and it looks just like a large thermos flask. The solar kettle gives you hot/boiling water wherever there is sunshine so is great for camping and even caravanning if you want to preserve gas. The solar kettle means you no longer have to rely completely on gas or meths camping stoves, so no more cumbersome gas canisters or dangerous naked flames, just use solar power, an unlimited source of free energy! The solar kettle is light at just 1.7 kg and compact too so great for hill-walkers and climbers to be used to melt snow and make tea, coffee, soup or even hot food for cold mountaineers like oats or dehydrated stews. In fact Alpine conditions are perfect for this solar kettle regardless of the air temperature, as the clear sunshine give ideal operating conditions. The kettle can also be used to sterilize water making it safe to drink, which means less water needs to be carried. In good strong sunlight, the solar kettle can negate the need for a conventional kettle entirely. But even in bad conditions it can help to pre-heat water and reduce the electricity, gas or solid fuel required. In Winter conditions you can use the solar kettle to keep water or beverages hot, by using any available solar radiation it can keep water hot for hours! So you can boil water, melt snow, sterilise water and utensils and make hot food – all at zero cost!